My sister-in-law came for a visit this last week, and all we did for over two days was watch movies, talk, laugh, and eat. She's a vegetarian, so when she visits, my challenge is to adapt my meat recipes to non-meat versions. This week, I "de-meatified" my taco recipe, and it turned out delicious. Here it is, and it's simple! Take one of the cans and empty it into a colander or strainer (make sure the holes are smaller than the beans!). Rinse and let drain. Pour out the other can with all its juice into a saucepan, then empty the colander beans into the same saucepan. Now all the beans are together and happy. Throw all the other ingredients into the saucepan with the beans. Stir and blend well. Now we're having FUN! Bean fun! After you see the beans get bubbly, turn down the heat to low and barely simmer with lid on for about 3 minutes. Don't boil! In fact, if you have one of those mini burners in the back of your stove, use that. After the 3-minute simmer, turn the heat off. Stir gently, then put the lid back on to keep them warm. Don't overcook the beans. 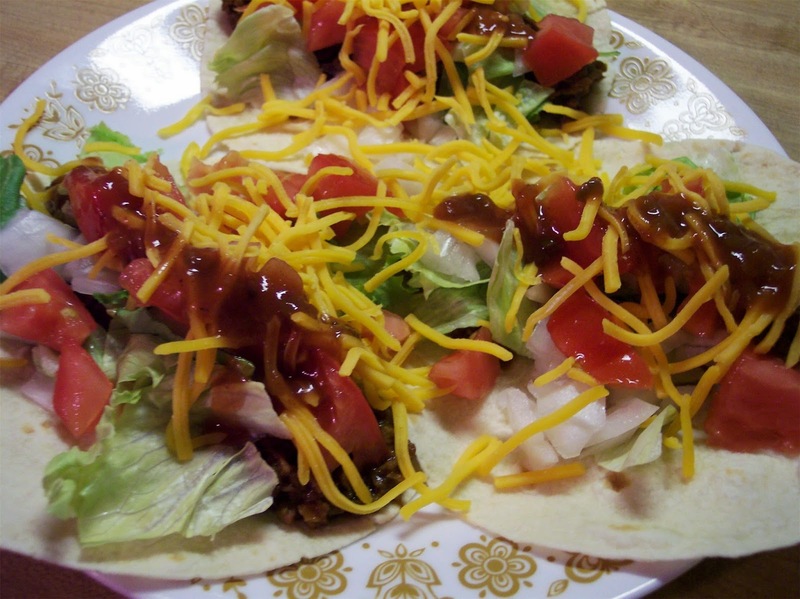 Toppings: Good toppings are things such as chopped onions, chopped tomato, cheddar or feta cheese, salsa or pico de gallo, diced green chilies or jalapenos, shredded lettuce or cabbage, cilantro, sour cream, and guacamole. I used feta cheese on mine instead of the traditional cheddar. It was delicious!